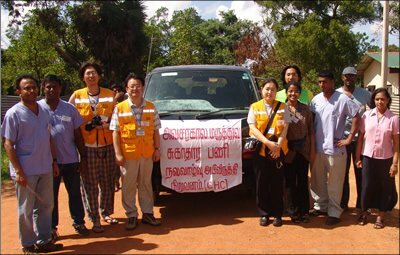 Two teams of doctors who arrived in Kilinochchi on Monday from Australia and Korea have set off to the East. On Monday, Tamil Eelam Health Service (TEHS) in the East issued an urgent warning as heavy rains in Batticaloa-Amparai have increased the danger of infectious diseases. The medical teams were briefed by the Planning and Development Secretariat (PDS) on the ground situation in the East. The doctors also recognised the destruction of many medical institutions in the East necessitating ad hoc medical centres and also the already acute shortage of doctors in the region. After a group study at the PDS, the teams also had discussions with the Head of the Tamil Eelam Health Services, who concurred with their decision and encouraged them to proceed to the East, according to the LTTE Peace Secretariat.